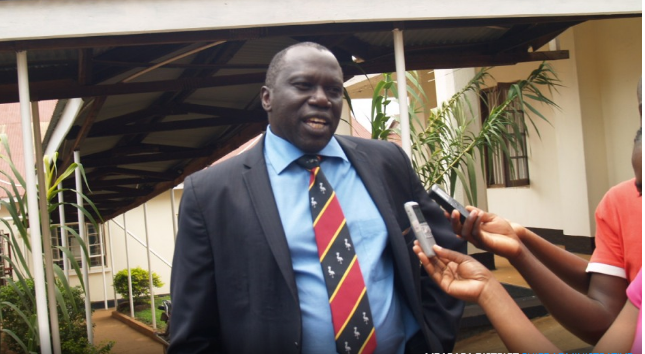 MBARARA- Godfrey Baryomunsi, the vice chairman Mbarara district and a section of councilors led by Robert Arinanye representing Bugamba Sub County have accused Felix Esoku Cuthbert, the CAO Mbarara for grossly frustrating implementation of council resolutions. They accuse him of being slow to ensure that council resolutions are implemented and his alleged connivance in selling most district properties including a number of plots to private individuals. Esoku has been in the centre of the district land row where it has been alleged that himself and a team of technocrats are hatching plans to sell district land in Kamukuzi and distributing staff houses amongst themselves. Another land has been the veterinary land opposite Municipal council offices where the land was sold to Mp Charles Ngabirano (Rwampara). Baryomunsi who sits on the District Executive Committee (DEC) the supreme body at the district while submitting in the council meeting on Wednesday expressed his dismay to CAO Esoku who snubbed the meeting on how he sluggishly implements council resolutions. He noted that on several occasions council has always tasked him to ensure that there should be an inventory of all land belonging to the district, those titled, untitled and those that have been threatened to be taken away by individuals, but he has not made any efforts to implement so. “Council is the policy formulating body for the district, and a lot of resolutions have been passed here but sometimes when am in DEC and see how things are being done it disheartens so much, our CAO has only one word that he tells you when ask him, he says ‘I will sort it, I will handle and things have remained like that for years, a lot of things have gone at his expense of sluggishness which we cannot accept,” Baryomunsi said. Council noted that a government in Nyihanga town council equivalent to 3.5 acres has been taken, a land title issued in the names of Fortunate Kyomukama and another one in Rwensinga, Rutoma playground and Kyenshama land and that Esoku has not tasked his parish chiefs how these lands were taken. Asaph Muhangi also a councilor moved a motion tasking the production committee to institute it into an Adhoc committee and make a report on the status of all district lands in the next council meeting, this was seconded unanimously. When contacted Esoku hesitated to comment on the accusations but rather noted that politicians always want things done at a high rate which is not the case. On the veterinary land Esoku blamed Uganda land commission whom they wrote seeking for guidance on the same but have never responded but rather went ahead to give out the land.